Welcome back to The Dollar Box, where I look at single issues and short runs of comics with a cover price of a dollar or less. 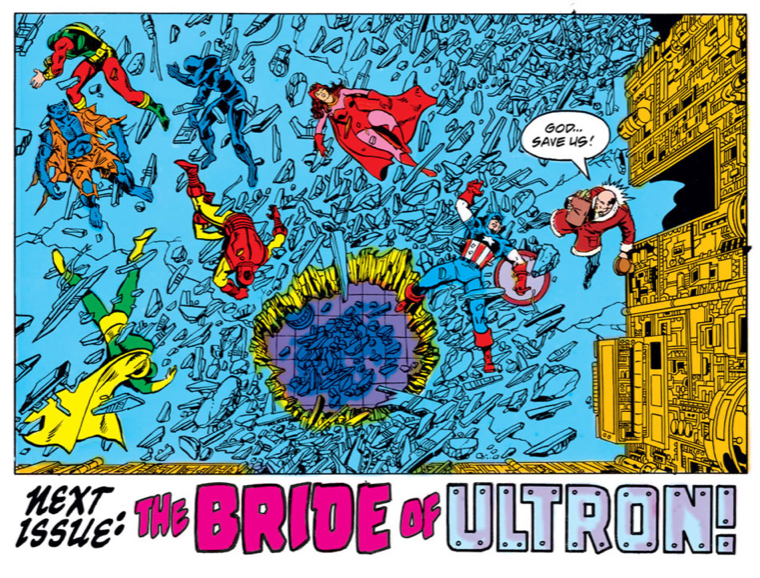 This month, with Ultron making his presence felt in Marvel’s current books, I thought it a good time to look at a classic Ultron story from the pages of Avengers #161-162. The 1970s were a golden age for the Avengers. The brand had not yet been diluted by West Coast Avengers or today’s endless spin-off books, and with only one place to go for Avengers action, Marvel lavished the title with their top talent. 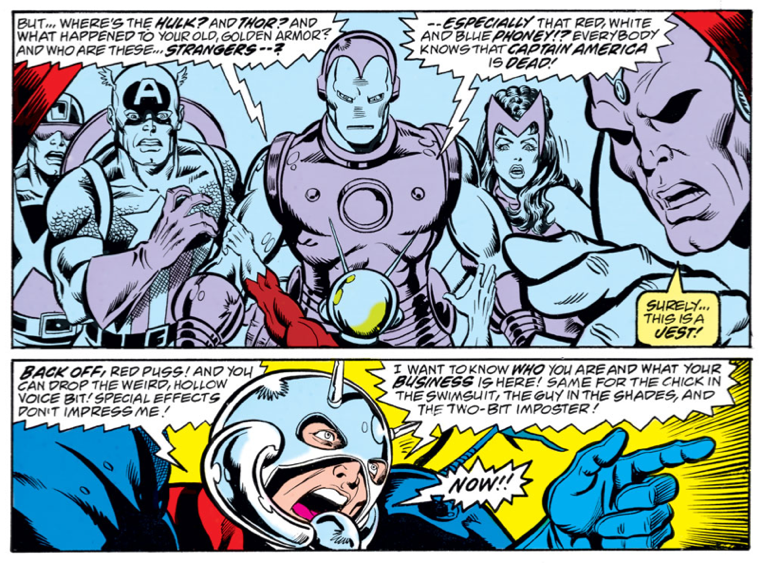 The decade began with Roy Thomas’ Kree-Skrull War, and continued under Steve Englehart in a series of stories that would test the Avengers both without and within. 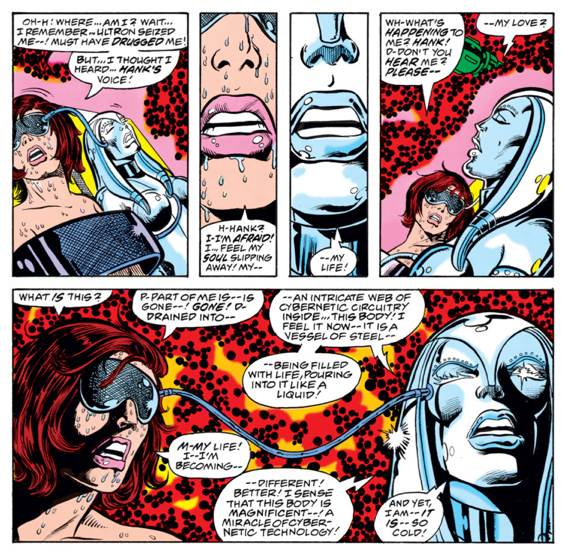 The era would conclude with a Roger Stern/John Byrne run where the Scarlet Witch would start to show some of the awesome power (and instability) that would later haunt her in Marvel events like The House of M.
But in between was a two-year run helmed by Jim Shooter, where he brought his finely-honed Silver Age sensibilities to Marvel’s premiere superhero team. Shooter’s Avengers are best remembered for the Korvac Saga, but my personal favorite portion of Shooter’s run is this two-part story from Avengers #161-162. Featuring rich characterization, explosive action, and extraordinarily tight pencils and powerful visual storytelling from artist George Perez, these issues represent the soul of late-1970s Avengers (and I’ll bet you a dollar that Marvel Studios will come around to mining these tales for film material, after they’ve finished their business with Thanos in 2015’s Avengers 2). This being a Silver Age-style Marvel comic, our heroes solve their differences by beating the tar out of each other, showcasing Shooter and Perez at the top of their game. 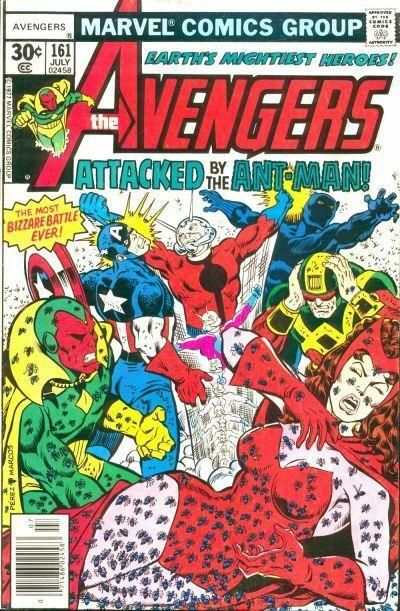 Perez orchestrates the visually-complicated team fight with relish, while Shooter demonstrates his deft touch with expository dialogue — making sure that readers know who each character is, and making clear why a seemingly-insignificant character like Ant Man poses a threat to earth’s mightiest heroes. 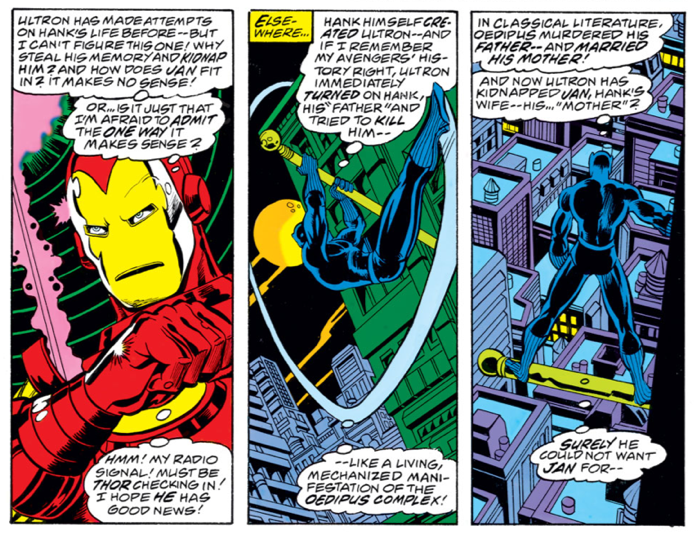 In the span of four perfect panels, we see how Ant Man can summon a swarm of ants to do his bidding; how those ants exploit Iron Man’s weakness by flooding through the eye-slits of his mask; and how Ant Man retains enough of his full-sized strength to clout Captain America on the jaw. Part of Shooter’s ethos was to make sure that any readers picking up a comic for the first time would not be completely lost, and this awkward speaking of characters’ names and out-loud restating of action and results is part of that agenda. But it also serves to provide a verbal, character-driven rhythm for these stories, where even veteran readers had something to see, nodding along as familiar characters behaved in believable ways. It’s the kind of storytelling that comics can do especially well, and a strength of the form that is rarely used by current creators. Having film characters speak aloud their internal monologues and footnote the uses and limitations of their powers would never wash on film, but when well-executed in a superhero comic, it is pure four-color fun. Shooter isn’t content just to recycle old tropes. 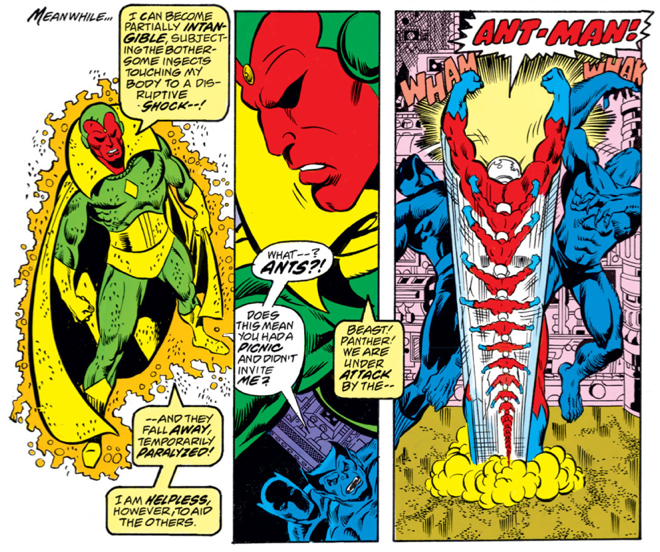 After making clear that the Vision’s powers are based on making himself insubstantial, he follows up with a power trick (never used before or since?) where the Vision defeats a swarm of ants with an electrified shock. 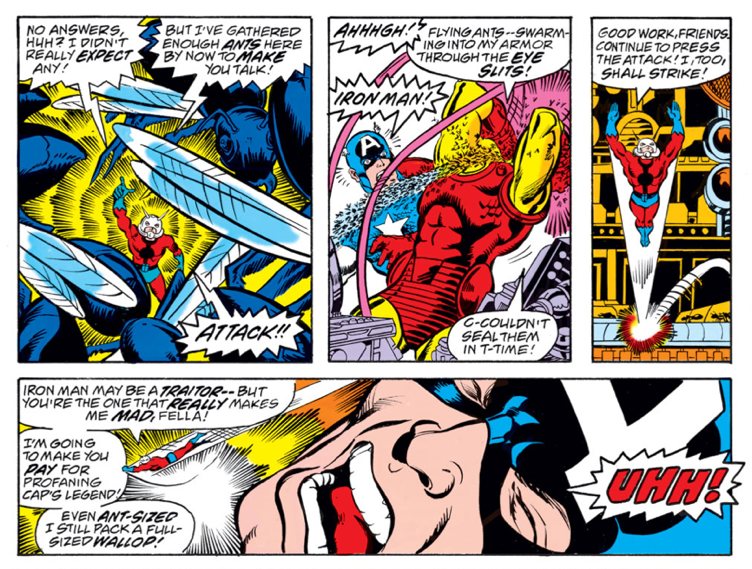 But that does nothing to stop Ant Man from taking out a pair of Avengers with his patented, grow-suddenly-to-full size sneak attack, expertly set in motion by Perez’s pencils. The timely arrive of Hank’s wife — Janet Pym, the Wasp — allows the Avengers to get the upper hand, and take stock of what drove Hank off his nut. Here Shooter employs his mastery of backstory, rooting Hank’s breakdown in the character’s checkered history. Madness isn’t too much to expect of a character who’s brain has been stressed by a career filled with growing and shrinking powers, and poor Hank has had breakdowns and multiple personalities in his past. The Avengers, of course, take all of this in stride, and quickly act to help their fallen friend. Even a transitional scene affords room for Shooter to provide characterization. Here we see the Beast — having only recently joined the team — struggling to fit in with the rest of the Avengers. Unlike most of the stories I review at The Dollar Box, this two-issue tale has plenty of loose ends … but they’re the right kinds of loose ends, deliberately-unresolved plot threads designed to bring you back the following issue. 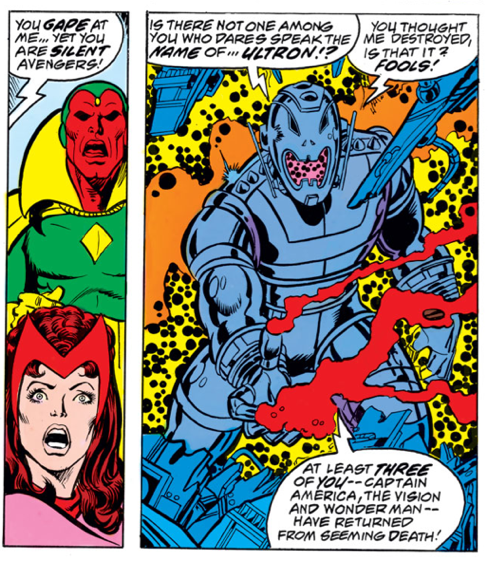 Hank Pym is still insane, and no one is sure what to make of Jocasta, who the final panel of this issue indicates played a pivotal-but-secret role in defeating Ultron. 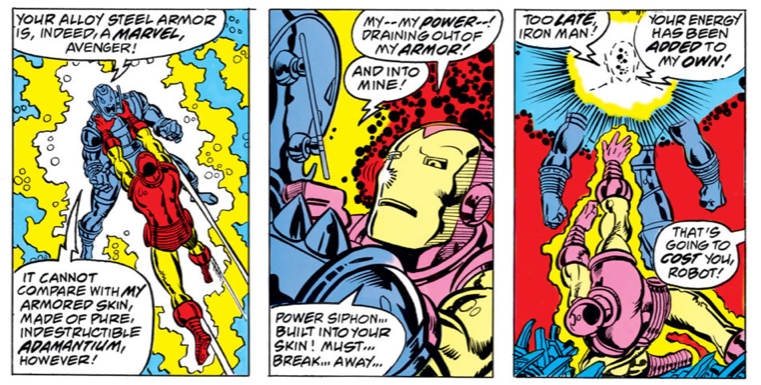 How will Janet Pym react to having part of her life force drained into a mechanical being? As far as our heroes are concerned, Captain America, the Beast, and the Scarlet Witch are all dead. Ultron is still on the loose. There’s even a subplot featuring Hawkeye and the Two-Gun Kid (!) that is ready to boil over! A great Avengers run lays just over the horizon, and these issues are a great place to jump on board. You can get each of them in decent condition for just a little bit more than a contemporary comic book, which is a bargain for a pair of the most iconic Avengers stories ever published. These issues are also a part of Marvel’s growing digital library. 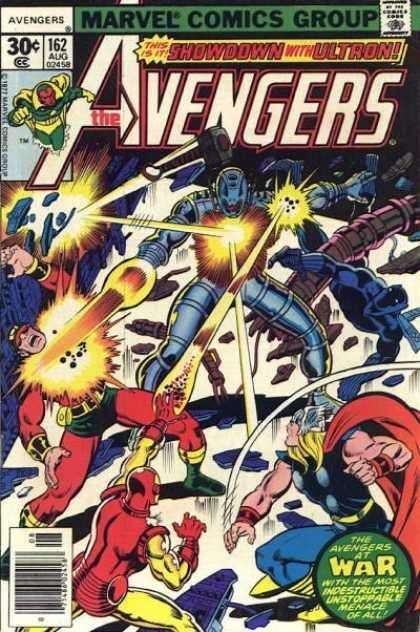 Avengers #161, the first Avengers comic I ever owned! 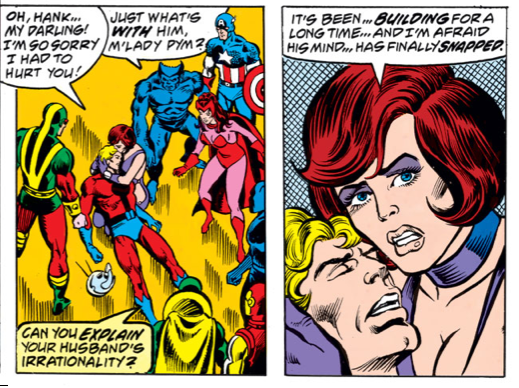 On page 11 of Avengers #161, the Wasp explains her husband’s rage at failed projects. Then later on page 15, we’re taken in inside the Pym’s home. In the study, there’s a portrait hanging on the wall. It’s of Reed Richards. It makes sense that a frustrated scientist would idolize the world’s most brilliant one. It also symbolizes the chasm between who the troubled Hank Pym is and what he wishes he was. It’s a subtle thing that George Perez does here, but it illustrates just how dialed in he and Jim Shooter were with these characters. I wholeheartedly agree that Perez had “extraordinarily tight pencils and powerful visual storytelling” for Avengers #161-162. It ranks among his best work. I’ll add that he was well served by his inker. 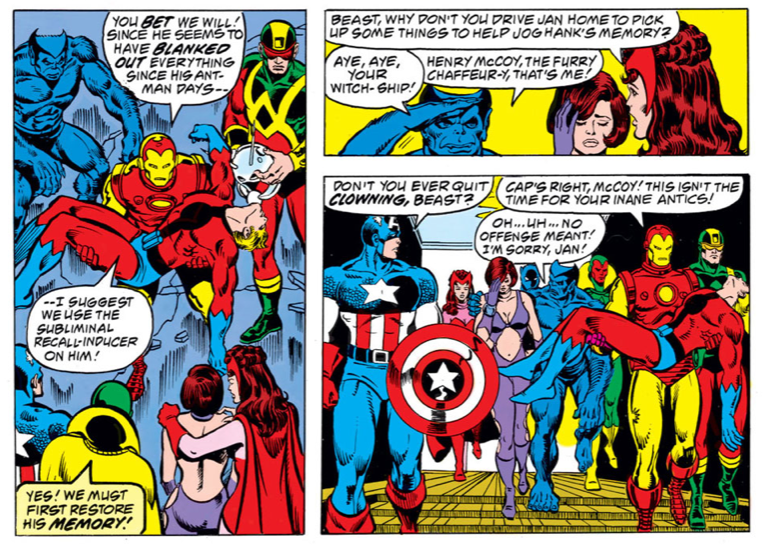 Vince Colletta and Mike Esposito made Perez’s earlier work on the Avengers look stiff. Sam Grainer was an improvement. But, with Pablo Marcos, Perez finally had an inker on the title that could enhance his pencils. How do you constantly hit the nerve on these reviews!?! You rock. These books were amongst my favorites as a lad. I could not get enough of Perez doing the Avengers at that time. Byrne has a run in this timeframe too, as I recall, which also made me ecstatic. One nitpick: Above you say that Shooter both wrote and drew for the LOSH back in the day. I was not aware of his artistic prowess? Did he really do some art for the Legion? This link below shows us some artwork from 14-year old Jimmy Shooter — the concept art for Mano and Validus of the Fatal Five!!! AWESOME! A handful of months earlier J Shooter penciled an issue of Super Villain Team – Up that crossed over from an Avenger story line. I don’t think he wrote it. I do believe he also colored at least 1 of the 2 issues above. If I remember correctly, the J Starlin Avengers Annual came out the next month or so. #163 was a Champions or Iron-Man fill in. Then 3 great Bryne issues and then #167 was the first and possibly best of the Korvak series. A final note: What If? The Avengers Had Never Been? Shooter, Kane, Janson.